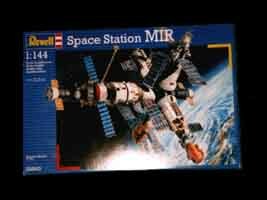 It was the end of an era when the Russian MIR space station came crashing down to earth last year. What better way to remember another of mankind's achievements than by building your very own 1:144 replica. If you are fed up building World War I planes or Spitfires (these seem to be all my nephew is bought for his birthday by older relatives) then Revell's space series is worth looking into. Every school boy is fascinated by space. This kit represents a mid-difficulty level and shouldn't prove to taxing for hardened model makers. I haven't put together a kit like this for a number of years, and then it was only to help my nephew who seemed to be more clued up than me anyway. This kit is fairly straight forward - no MFI-style instructions to get you frustrated. Everything is clear and concise. I took my time completing this model and I think I did a pretty good job - I am actually quiet proud of the finished result.